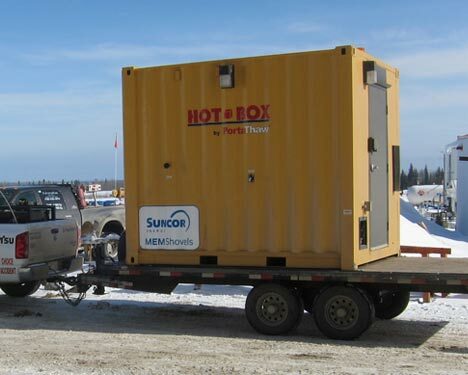 HotBox™ is a mobile heating system to assist downed equipment that needs that extra “punch” to get started. The unit is equipped with multiple hot air supply ducts for simultaneous heating of key target areas. Optionally included is a 24V battery charger and air compressor for boosting air starter tank pressure. 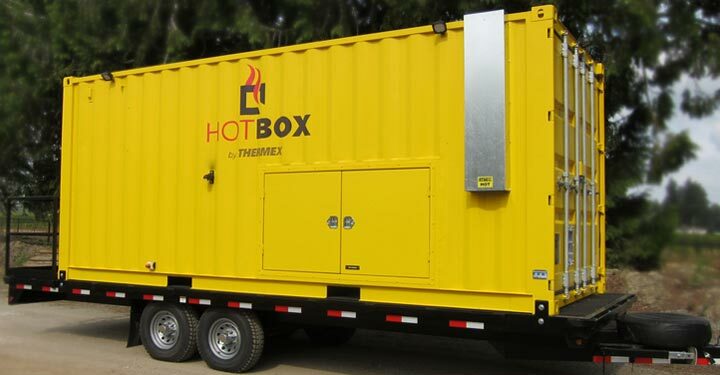 The HotBox™ is entirely self-sufficient with on-board diesel tank and gen-set power. HotBox™ also includes the PortaThaw® Cold Start system which combines multiple heating modes to rapidly heat up cold soaked machines and get them operational in short order. HotBox™ is equipped with a grip-strut walkway, interior and exterior safety lighting, an external filler neck for the diesel tank and a fuel gauge. The unit can be operated from the external control cabinet with manual on / off switches for the air heaters and the PortaThaw® coolant heating system. The HotBox™ also includes a large weather proof storage cabinet with external doors for quick access. Internally there is a dedicated shelf storage for hot-air ducting hoses. This figure shows how the HotBox™ heating module works. In this example the HotBox™’s air heaters and PortaThaw® coolant heater are being used to thaw a frozen excavator.